Preheat oven to 450°. Place 12-inch cast iron skillet in the pre-heated oven for 10 minutes. Remove skillet from oven and add remaining tablespoon ghee, quickly swirling to coat. Arrange apple slices in a pinwheel design around the skillet. Return the skillet to the oven for 5 minutes. Meanwhile, blend eggs in a blender or food processor on high speed for 1 minute, until light and frothy. Slowly add coconut milk, 2 tablespoons melted ghee, maple syrup, and pumpkin puree and blend for 30 seconds or until smooth. Add almond flour, arrowroot flour, salt, and pumpkin pie spice, blending until just combined. Take the skillet out of the oven and pour batter in. The apple slices may float and move around a bit—that’s okay! Return to oven, baking for 20 minutes or until puffed and golden brown around the edges. Prepare the cashew cream by blending all ingredients in a food processor or high-powered blender until smooth. 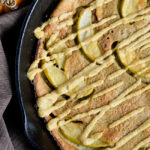 Drizzle the finished pancake with pumpkin cashew cream and serve immediately. You can top with maple syrup, additional apples, or toasted nuts if you want!